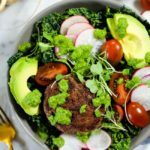 Quick, easy and real tasty, this burger salad with pesto is the best way to eat a clean and satisfying Paleo + Whole30 lunch or dinner! 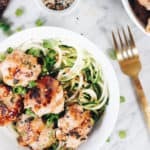 It is also one of our favorite ways to meal prep. 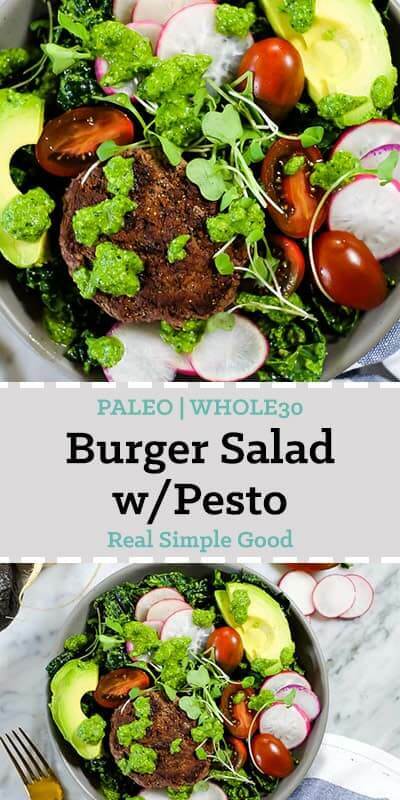 You’re really going to enjoy the dairy-free pesto with this Paleo + Whole30 burger salad. It’s quickly become one of my favorite combinations! The pesto has such a fresh and sharp flavor, and it helps to really tame the kale. I like to make my pesto first, and then add some of it to the kale you’ll be using for your burger salad. 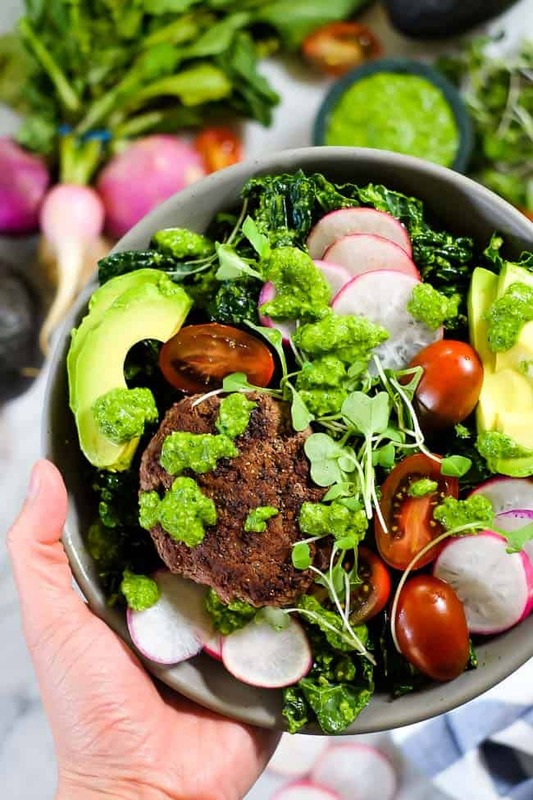 Mix the pesto into the kale with a spoon, and then let it sit in the fridge while you make the rest of your burger salad. The kale will get so much more tender, especially if you use one like dinosaur kale that is a little more rigid. 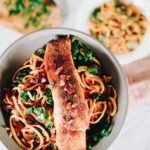 You’ve likely heard us talk before about how we like to make a big dinner on Sunday nights that we can then use the leftovers of for easy meals during the week. 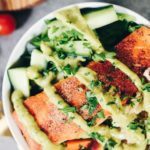 This burger salad with pesto is one of my favorite meal prep recipes. You can make a bunch of burger patties, and store them in the fridge. The pesto has lemon in it, so it stays fresh in the fridge for a few days in an airtight container. 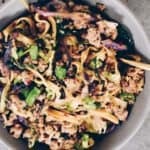 You can use the leftovers for easy lunches during the week. 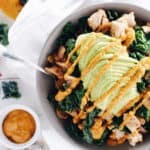 We’ve given you some ideas for toppings and veggies to use, but really you can use whatever you love most or whatever you have on hand. Consider just going for a stroll at your local farmer’s market and picking up whatever looks good. It’s so great to get to know your local farmers and use the freshest, most local produce. It really is the healthiest way to eat and nourish your body! 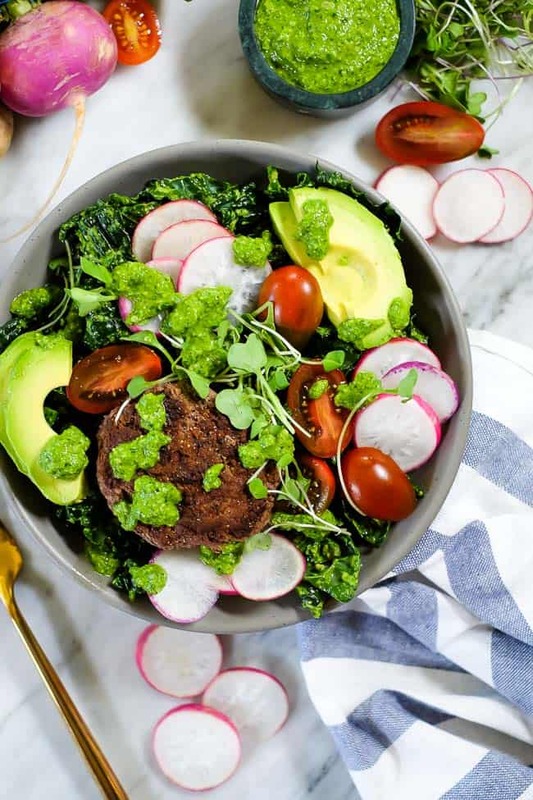 Whether you just want an easy weeknight meal or you want to do a little meal prep over the weekend, make this burger salad with pesto! 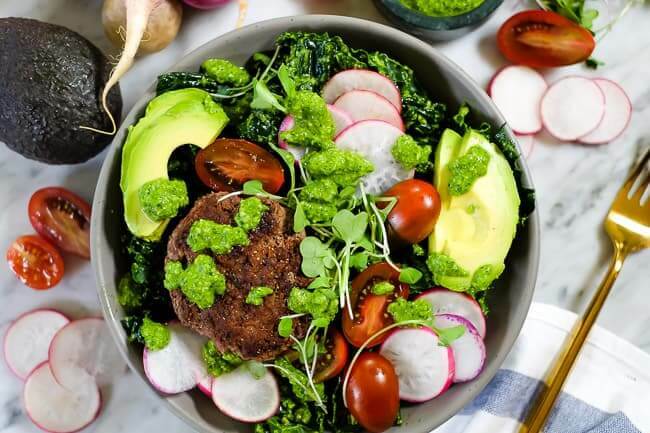 You’ll love the fresh and bold flavors of the pesto paired with kale and all the toppings you like! Leave a comment to let us know how it goes, and take a picture to share on Instagram. Tag us @realsimplegood, so we can see! Also, give us a follow on Instagram if you don’t already! 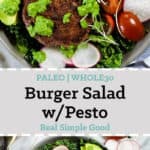 Quick, easy and real tasty, this burger salad with pesto is the best way to eat a clean and satisfying Paleo + Whole30 lunch or dinner! 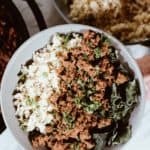 It is also one of our favorite ways to meal prep. 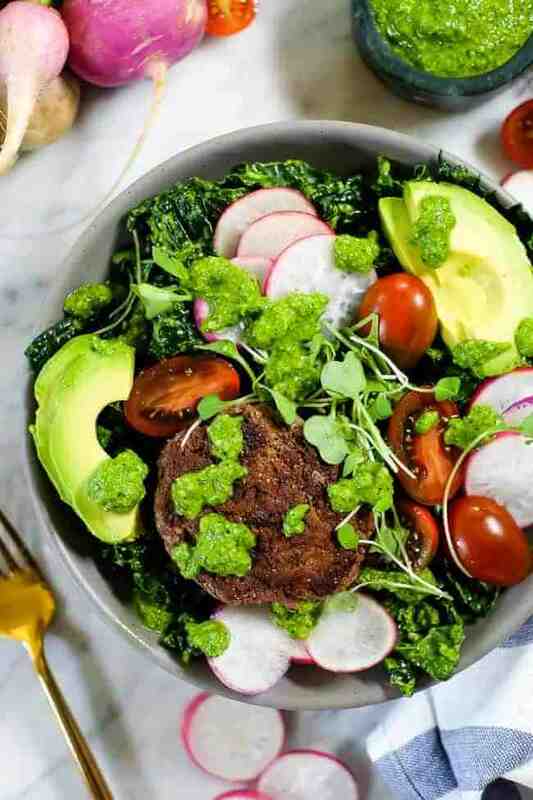 You're really going to enjoy the dairy-free pesto with this Paleo + Whole30 burger salad. Start by chopping your kale and set aside. Make pesto. Place all of the ingredients except the olive oil, salt and pepper in a food processor and blend until everything is combined. While the food processor is still running, stream in olive oil until smooth and creamy. Stop the food processor and season with salt and pepper, to taste. Form ground beef into four evenly sized patties. Season with garlic powder, salt and pepper on both sides. Just about a pinch of each on each side. In a large skillet over medium heat, add avocado oil. Once hot, place burgers in pan and cook 5-6 minutes each side for medium burgers. Once burgers are done, plate with a base of kale, the burger on top and the rest of the toppings. Drizzle extra pesto everything and enjoy!